PLEASE DO NOT BUY THIS ITEM IF YOU HAVE A PROJECTOR - IF YOU HAVE AN ACTIVE 3D TELEVISION OR IF YOU PLAN TO USE THESE 3D GLASSES IN AN IMAX 3D THEATER! Bulk Wholesale Lot - Purchase as many or as few as you like! Works perfectly with all passive 3D Televisions - SONY, Panasonic, Vizio, Toshiba, LG, Philips and JVC also RealD Matched to work in home or in traditional theaters! Fun for the whole family! Use our Passive 3D Glasses from Ultimate 3D Heaven in 3D theaters as well as in your home! No need to break the bank as our 3D glasses have got you covered. We always strive you bring you the best value for your money where the product is definitely worth the investment. With Ultimate 3D Heaven 3D Glasses you can turn your Living Room into a Virtual Reality 3D Theater. Our Premium Pink and Blue Kids series glasses are perfect for both children and adults and young adults with slimmer faces. With multiple kids glasses no more having kids fight over 3D glasses or getting butter from their popcorn or treats smeared on the adult's glasses (scratch resistant lenses and a glasses cleaning cloth make cleanup and reuse breeze). These 3D Glasses Work Flawlessly with all home Passive 3D televisions (and with any other application that uses Circular 3D technology) - Also works perfectly in all RealD Theaters (and in any other 3D theater that uses Circular 3D technology). 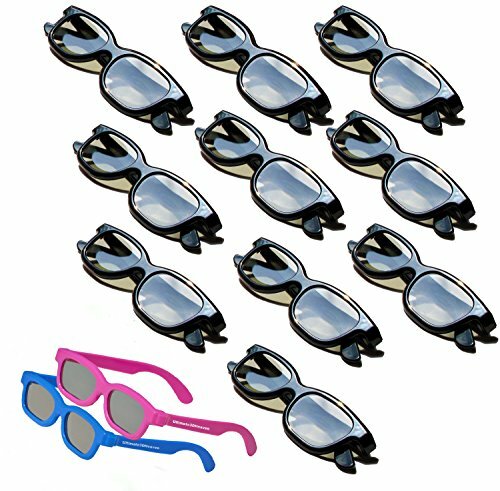 10 Adult Size Circular Polarized 3D Glasses for Passive 3D Televisions. Includes 2 Premium Kids 3DHeaven 3D Glasses - 1 Blue Pair - 1 Pink Pair. Works perfectly with all passive 3D Televisions and RealD Matched to work in home or traditional 3-D theaters! 3DHeaven glasses sized just right for smaller heads. Perfect for kids of all ages (recommended for ages 3 and up)!